How would you define Continuous Integration and what specific components does a CI server contain? Continuous Integration is a software development practice where members of a team integrate their work frequently, usually each person integrates at least daily - leading to multiple integrations per day. Each integration is verified by an automated build (including test) to detect integration errors as quickly as possible. Update: I sent them this image, I couldn't find a simpler one. I actually like all 3 answers – for different reasons. I feel like logging in just to thank them all! When someone changes the files that make up the software product and then attempts to check them in (in other words, attempts to integrate the changes into the main product code) you want to make sure that software can still be successfully built. 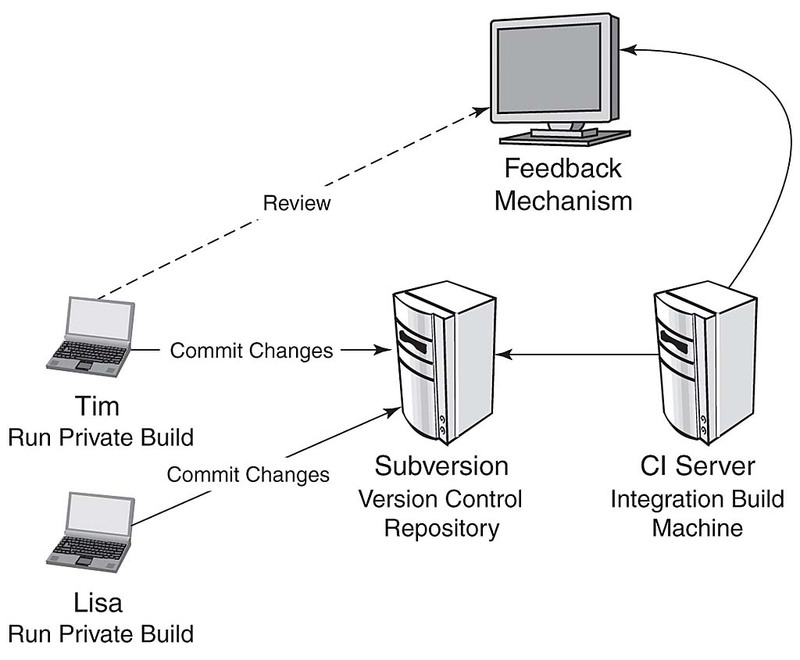 There is usually an external system, called the CI server, that either periodically or on every change, will grab the source files from version control, and attempt to build the product (compile/test/package). If the CI server can successfully do a build, the changes have been successfully integrated. CI is important, because it ensures that on a continuous basis, you have a working product. This is important for all the developers who are working on the software as well as for all the people who want to have access to daily releases of the product, like QA. I guess for your marketing department it is not important how CI works, but what CI means for new releases of your software. CI will ideally mean that you can produce a new potentially releaseable version of your software every day, ready to be presented or sold to your customer, with some new features, functionality or bugfixes added. That does not mean you must deliver the new version every day, but you can if you want. For example, if you have a new feature set planned to be officially released for the "2015"er version of your software, and you have parts of that feature set already coded and integrated today, the marketing guys can take the current version of your software and show it - more or less safely - at the next conference now in 2013. Without CI, they had to ask your team for an unplanned code freeze, every team member had to integrate the half-baked feature he is working on into the product, they might not have enough automatic tests ready, and guess what will happen at the conference - the "alpha version" of your 2015er release will have a much higher risk of crashing, especially when the new features are demonstrated. You can't know what CI is unless you know what we used to do. Imagine a system with 3 parts. There's a UI that gathers data and puts it in the database. There's a reporting system that makes reports from the database. And there's some sort of server that monitors the database and sends email alerts if certain criteria are met. Each dev would work on their piece and test their piece using their own database copy, for weeks or months. During this time the devs would not run each other's code, nor try to use a version of the database that had been created by someone else's code. The report writer would just hand add a bunch of sample data. The alert writer would hand add records that simulated report events. And the GUI writer would look at the database to see what the GUI had added. Over time, the devs would realize the spec was wrong in some way, such as not specifying an index or having too short a field length, and "fix" that in their version. They might tell the others, who might act on it, but usually these things would go on a list for later. When all three parts were completely coded, and tested by their devs, and sometimes even tested by the users (showing them a report, a screen or an email alert) then would come the "integration" phase. This was often budgeted at several months but would still go over. That field length change by dev 1 would be discovered here, and would require devs 2 and 3 to make huge code changes and possibly UI changes too. That extra index would wreak its own havoc. And so on. If one of the devs was told by a user to add a field, and did, now would be the time the other two had to add it also. This phase was brutally painful and pretty much impossible to predict. So people began to say "we have to integrate more often." "We have to work together from the beginning." "When one of us raises a change request [that's how we talked then] the others have to know about it." Some teams began to do integration tests earlier while continuing to work separately. And some teams began to use each other's code and output all the time, from the very beginning. And that became Continuous Integration. Also, if you find it hard to believe teams would be disconnected around a shared resource like a database, you really won't believe (but it's true) that the same approach was taken to code. You're going to write a function I can call? That's great, go ahead and do that, I will just hardcode what I need in the meantime. Months later I'll "integrate" my code so it calls your API and we'll discover it blows up if I pass null, I blow up if it returns null (and it does that a lot) it returns things that are too large for me, it can't handle leap years, and a thousand other things. Working independently and then having an integration phase was normal. Now it sounds like insanity. Not the answer you're looking for? Browse other questions tagged continuous-integration or ask your own question. Continuous Integration : which frequency?